The CMH option in the TABLES statement gives a stratified statistical analysis of the relationship between the row and column variables after controlling for the strata variables in a multiway table. For example, for the table request A*B*C*D, the CMH option provides an analysis of the relationship between C and D, after controlling for A and B. The stratified analysis provides a way to adjust for the possible confounding effects of A and B without being forced to estimate parameters for them. The CMH analysis produces Cochran-Mantel-Haenszel statistics, which include the correlation statistic, the ANOVA (row mean scores) statistic, and the general association statistic. For tables, the CMH option also provides Mantel-Haenszel and logit estimates of the common odds ratio and the common relative risks, in addition to the Breslow-Day test for homogeneity of the odds ratios. Exact statistics are also available for stratified tables. If you specify the EQOR option in the EXACT statement, PROC FREQ provides Zelen’s exact test for equal odds ratios. If you specify the COMOR option in the EXACT statement, PROC FREQ provides exact confidence limits for the common odds ratio and an exact test that the common odds ratio equals one. Let the number of strata be denoted by q, indexing the strata by . Each stratum contains a contingency table with X representing the row variable and Y representing the column variable. For table h, denote the cell frequency in row i and column j by , with corresponding row and column marginal totals denoted by and , and the overall stratum total by . 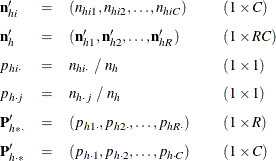 Because the formulas for the Cochran-Mantel-Haenszel statistics are more easily defined in terms of matrices, the following notation is used. Vectors are presumed to be column vectors unless they are transposed . and where denotes Kronecker product multiplication and is a diagonal matrix with the elements of on the main diagonal. is a matrix of fixed constants based on column scores and row scores . When the null hypothesis is true, the CMH statistic has an asymptotic chi-square distribution with degrees of freedom equal to the rank of . If is found to be singular, PROC FREQ prints a message and sets the value of the CMH statistic to missing. PROC FREQ computes three CMH statistics by using this formula for the generalized CMH statistic, with different row and column score definitions for each statistic. The CMH statistics that PROC FREQ computes are the correlation statistic, the ANOVA (row mean scores) statistic, and the general association statistic. These statistics test the null hypothesis of no association against different alternative hypotheses. The following sections describe the computation of these CMH statistics. Caution: The CMH statistics have low power for detecting an association in which the patterns of association for some of the strata are in the opposite direction of the patterns displayed by other strata. Thus, a nonsignificant CMH statistic suggests either that there is no association or that no pattern of association has enough strength or consistency to dominate any other pattern. The correlation statistic, popularized by Mantel and Haenszel, has 1 degree of freedom and is known as the Mantel-Haenszel statistic (Mantel and Haenszel 1959; Mantel 1963). The alternative hypothesis for the correlation statistic is that there is a linear association between X and Y in at least one stratum. If either X or Y does not lie on an ordinal (or interval) scale, this statistic is not meaningful. To compute the correlation statistic, PROC FREQ uses the formula for the generalized CMH statistic with the row and column scores determined by the SCORES= option in the TABLES statement. See the section Scores for more information about the available score types. The matrix of row scores has dimension , and the matrix of column scores has dimension . When there is only one stratum, this CMH statistic reduces to , where r is the Pearson correlation coefficient between X and Y. When nonparametric (RANK or RIDIT) scores are specified, the statistic reduces to , where is the Spearman rank correlation coefficient between X and Y. When there is more than one stratum, this CMH statistic becomes a stratum-adjusted correlation statistic. The ANOVA statistic can be used only when the column variable Y lies on an ordinal (or interval) scale so that the mean score of Y is meaningful. For the ANOVA statistic, the mean score is computed for each row of the table, and the alternative hypothesis is that, for at least one stratum, the mean scores of the R rows are unequal. In other words, the statistic is sensitive to location differences among the R distributions of Y. The matrix of column scores has dimension , and the column scores are determined by the SCORES= option. where is an identity matrix of rank R – 1 and is an vector of ones. This matrix has the effect of forming R – 1 independent contrasts of the R mean scores. When there is only one stratum, this CMH statistic is essentially an analysis of variance (ANOVA) statistic in the sense that it is a function of the variance ratio F statistic that would be obtained from a one-way ANOVA on the dependent variable Y. If nonparametric scores are specified in this case, the ANOVA statistic is a Kruskal-Wallis test. When there is more than one stratum, this CMH statistic corresponds to a stratum-adjusted ANOVA or Kruskal-Wallis test. In the special case where there is one subject per row and one subject per column in the contingency table of each stratum, this CMH statistic is identical to Friedman’s chi-square. See Example 3.9 for an illustration. PROC FREQ generates both score matrices internally. When there is only one stratum, the general association CMH statistic reduces to , where is the Pearson chi-square statistic. When there is more than one stratum, the CMH statistic becomes a stratum-adjusted Pearson chi-square statistic. Note that a similar adjustment can be made by summing the Pearson chi-squares across the strata. However, the latter statistic requires a large sample size in each stratum to support the resulting chi-square distribution with q(R–1)(C–1) degrees of freedom. The CMH statistic requires only a large overall sample size because it has only (R–1)(C–1) degrees of freedom. See Cochran (1954); Mantel and Haenszel (1959); Mantel (1963); Birch (1965); Landis, Heyman, and Koch (1978). If you specify the CMH(MANTELFLEISS) option in the TABLES statement, PROC FREQ computes the Mantel-Fleiss criterion for stratified tables. The Mantel-Fleiss criterion can be used to assess the validity of the chi-square approximation for the distribution of the Mantel-Haenszel statistic for tables. For more information, see Mantel and Fleiss (1980); Mantel and Haenszel (1959); Stokes, Davis, and Koch (2012); Dmitrienko et al. (2005). The Mantel-Fleiss guideline accepts the validity of the Mantel-Haenszel approximation when the value of the criterion is at least 5. When the criterion is less than 5, PROC FREQ displays a warning. The CMH option provides adjusted odds ratio and relative risk estimates for stratified tables. For each of these measures, PROC FREQ computes a Mantel-Haenszel estimate and a logit estimate. These estimates apply to n-way table requests in the TABLES statement, when the row and column variables both have two levels. For example, for the table request A*B*C*D, if the row and column variables C and D both have two levels, PROC FREQ provides odds ratio and relative risk estimates, adjusting for the confounding variables A and B. The choice of an appropriate measure depends on the study design. For case-control (retrospective) studies, the odds ratio is appropriate. For cohort (prospective) or cross-sectional studies, the relative risk is appropriate. See the section Odds Ratio and Relative Risks for 2 x 2 Tables for more information on these measures. Throughout this section, z denotes the th percentile of the standard normal distribution. PROC FREQ provides Mantel-Haenszel and logit estimates for the common odds ratio for stratified tables. It is always computed unless the denominator is 0. For more information, see Mantel and Haenszel (1959) and Agresti (2002). If any table cell frequency in a stratum h is 0, PROC FREQ adds 0.5 to each cell of the stratum before computing and (Haldane 1955) for the logit estimate. The procedure provides a warning when this occurs. PROC FREQ provides Mantel-Haenszel and logit estimates of the common relative risks for stratified tables. It is always computed unless the denominator is 0. See Mantel and Haenszel (1959) and Agresti (2002) for more information. If or is 0, PROC FREQ adds 0.5 to each cell of the stratum before computing and for the logit estimate. The procedure prints a warning when this occurs. For more information, see Kleinbaum, Kupper, and Morgenstern (1982, Sections 17.4 and 17.5). When you specify the CMH option, PROC FREQ computes the Breslow-Day test for stratified tables. It tests the null hypothesis that the odds ratios for the q strata are equal. When the null hypothesis is true, the statistic has approximately a chi-square distribution with q–1 degrees of freedom. See Breslow and Day (1980) and Agresti (2007) for more information. where E and Var denote expected value and variance, respectively. The summation does not include any table that contains a row or column that has a total frequency of 0. If equals 0 or if it is undefined, PROC FREQ does not compute the statistic and prints a warning message. For the Breslow-Day test to be valid, the sample size should be relatively large in each stratum, and at least 80% of the expected cell counts should be greater than 5. Note that this is a stricter sample size requirement than the requirement for the Cochran-Mantel-Haenszel test for tables, in that each stratum sample size (not just the overall sample size) must be relatively large. Even when the Breslow-Day test is valid, it might not be very powerful against certain alternatives, as discussed in Breslow and Day (1980). See Tarone (1985); Jones et al. (1989); Breslow (1996) for more information. If you specify the EQOR option in the EXACT statement, PROC FREQ computes Zelen’s exact test for equal odds ratios for stratified tables. Zelen’s test is an exact counterpart to the Breslow-Day asymptotic test for equal odds ratios. The reference set for Zelen’s test includes all possible tables with the same row, column, and stratum totals as the observed multiway table and with the same sum of cell (1,1) frequencies as the observed table. The test statistic is the probability of the observed table conditional on the fixed margins, which is a product of hypergeometric probabilities. The p-value for Zelen’s test is the sum of all table probabilities that are less than or equal to the observed table probability, where the sum is computed over all tables in the reference set determined by the fixed margins and the observed sum of cell (1,1) frequencies. This test is similar to Fisher’s exact test for two-way tables. For more information, see Zelen (1971); Hirji (2006); Agresti (1992). PROC FREQ computes Zelen’s exact test by using the polynomial multiplication algorithm of Hirji et al. (1996). If you specify the COMOR option in the EXACT statement, PROC FREQ computes exact confidence limits for the common odds ratio for stratified tables. This computation assumes that the odds ratio is constant over all the tables. Exact confidence limits are constructed from the distribution of , conditional on the marginal totals of the tables. Because this is a discrete problem, the confidence coefficient for these exact confidence limits is not exactly but is at least . Thus, these confidence limits are conservative. See Agresti (1992) for more information. PROC FREQ computes exact confidence limits for the common odds ratio by using an algorithm based on Vollset, Hirji, and Elashoff (1991). See also Mehta, Patel, and Gray (1985). When the observed sum equals the lower bound l, PROC FREQ sets the lower confidence limit to 0 and determines the upper limit with level . Similarly, when the observed sum equals the upper bound u, PROC FREQ sets the upper confidence limit to infinity and determines the lower limit with level .